With more than 100,000 substances and chemical entities in its product portfolio, microbiology and organic fine biochemical CDMO and specialist supplier, BIOSYNTH AG, has countless molecular stories to tell. This month we are focusing on two related substances, harmane and norharmane, that unearth curious links between indigenous tribes in the Amazon rain forest and treatment of Parkinson’s disease. Harmane (BIOSYNTH catalog number H-1150) and norharmane (N-8700), are both indole alkaloids, nitrogen containing heterocycles that belong to the class known as beta-carbolines (β-carbolines). Structurally, these consist of a pyridine ring fused to an indole skeleton, with the ethylamine chain re-connected to the indole ring via an extra carbon atom, to produce a three-ringed structure. In pharmacology, β-Carboline alkaloids are known to act as benzodiazepine inverse agonists in plants and animals. Some β-carbolines, notably tryptoline and pinoline, may be formed naturally in the human body but harmane and norharmane are methylated heterocyclic amine derivatives primarily found in external sources, in a variety of foods including coffee, sauces and cooked meats, as well as in tobacco smoke. Over millennia, Harmane and Norharmane have been identified as neurotoxins, with plants containing these alkaloids originally used in hallucinogenic drinks or snuffs in religious ceremonies particularly in the South and Central America. More recently, the neurological effects of these beta-carbolines have become well characterized at the molecular level (Pfau & Skog, 2004), with norharmane and harmane showing molecular similarity to neurotoxins known to induce Parkinson’s disease and elevated concentration of Harmane noted in the blood of Parkinson’s disease patients. (Louis et al., 2014). Additionally, harmane is a monoamine oxidase inhibitor that is believed to be the main endogenous ligand for the benzodiazepine receptor that joins melatonin in being implicated in helping the pineal gland to regulate the human sleep cycle. 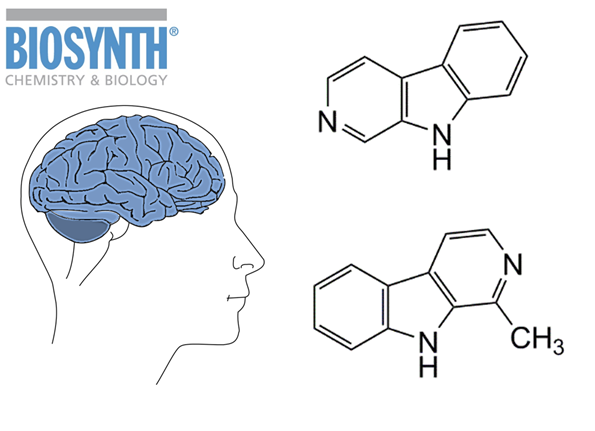 As benzodiazepine receptor inverse agonists β-carbolines can also have anxiogenic and memory enhancing effects. Interestingly, methyl-β-carbolines such as harmane appear to induce DNA damage under exposure to ultra-violet light. Click on BIOSYNTH Molecule of the Month: 03/2018 for more information. Harmane and norharmane have powerful neurotoxin effects that may hold keys to treatments for tremor and Parkinson’s disease.